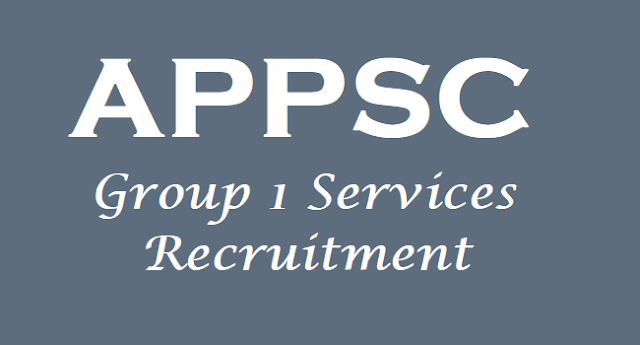 APPSC Group 1 services posts Main Exam Results, Interview, Certificates verification dates 2018/ APPSC Group 1 services posts Main Exam Results for Interview (Oral test) 2018:: APPSC Group 1 services posts Main Exam Time table, Results 2017: APPSC Group 1 services posts Main Exam Time table 2017/ Time Table for Group-I Services (Notification No.36/2016) Main Written (Conventional Type) Examination for Details : APPSC Group 1 posts Screening test Results announced,Answer key released, check it now/ APPSC Group 1 posts Preliminary Examination Results/ Answer key released, check it now: APPSC Group-I Services Screening Test Results (General Recruitment) 36/2016: Screening Test Results Qualified for Mains of Group I services (Notification No.36/2016). 1. List of Candidates Qualified for Group I Mains (Notification No.36/2016), 2. List of Candidates appeared for Group-screening test with marks (Notification No.36/2016), 3. List of Rejection (Group-I Services Notification No.36/2016) are placed on its web portal. Andhra Pradesh Public Service Commission (APPSC) has released the answer key of the screening test conducted today for the recruitment to Group - I Services in the state. The answer keys have been published in the official website of the commission. The commission has also made the facility to raise the objections to the Group 1 services screening test answer key published today. This can be done till May 15. APPSC Group 1 services posts Final Results: All the candidates who have been waiting to know their marks after attending the Mains and Interview rounds of Group-I exams, conducted by Andhra Pradesh Public Service Commission. The results have been leaked on Tuesday and to not hold back and give the candidates, the official confirmation about the selections and marks received, thay have made them available online. You can login to the APPSC government website and get the results. Total 294 candidates appeared for Mains and Interviews. Also, 2691 members who wrote Mains, can also see their detailed marks list. conclusion of Interviews the General Ranking List of all the Candidates appeared in the Main Examination and Interview marks of the Interviewed candidates are published today on the Commission`s Website. Out of a total of 294 candidates called for Interview, one candidate was rejected as found ineligible in PH category and four candidates were absent. Only those candidates who appeared in all papers of Main examination earlier held in 2012 were pickup and called for Interview on the basis of Written Examination conducted in 2016. Andhra Pradesh Public Service Commission (APPSC) has released the mark list of candidates who had appeared for the Group 1 services main exam and interview. The main exam was held in 2016 for 2691 candidates who had qualified for the exam in the previous stage of selection process. The Commission has released the marks section wise: general English, History & Indian Constitution, Indian Economy & AP Economy, Science & Technology, Data Appreciation & Interpretation and also the total marks. Candidates who had appeared for the examination can check their marks at the official website psc.ap.gov.in. APPSC Group 1 Services Main exam result was declared in December 2017. The Commission had selected candidates in the ratio of 1:2 on the basis of the re exam held from 14 September 2016 till 24 September 2016. The examination was held at Hyderabad, Vijayawada, Visakhapatnam, and Tirupathi for Group-I Services (Limited & General) recruitment. A total of 294 candidates were shortlisted for interview which was held in January-February 2018. Only those candidates who appeared in all papers of earlier written examination in 2012 were called for Interview. The interview mark list carries the marks of the candidates out of total 783 marks (708 marks for written exam and 75 marks for interview). The list of candidates provisionally qualified for Oral Test (Interview) for Group-I Services Recruitment, Notification No: 36/2016, dated 30.12.2016 on the basis of Main examination (conventional Type) held from 17.08.2017 to 28.08.2017 is published in the Web-site of the Commission psc.ap.gov.in and also displayed in the Commission’s Notice Board. The verification of Original certificates and interviews will be held from 12/03/2018 to 23/03/2018. Further details may be checked Commission’s website. It is hereby notified that on the basis of the Main (Written) Examination held from 17/08/2017 to 28/08/2017 FN at Visakhapatnam, Vijayawada, Tirupathi and Ananthapuramu for Group-I Services (General) Recruitment vide Notification No: 36/2016 dated. 30.12.2016; the candidates with the following Registered Numbers have been provisionally admitted for the ORAL TEST (Interview) in terms and conditions of Notification No.36/2016 which will be held from 12/03/2018 to 23/03/2018, in the Office of the Commission, at New HOD’S Building, 2nd Floor, M.G. Road, Opp. Indira Gandhi Municipal Complex, Vijayawada, Andhra Pradesh-520010. The candidate wise schedule of Oral Test (interview) will be placed in the website of the Commission shortly. Individual call letters will be sent to candidates in within few days. A copy of this result can also be seen on the Website:www.psc.ap.gov.in and also in the Notice Board of the Commission. 2. The candidates who are qualified for ORAL TEST (Interview) are required to produce the original Certificates at the time of verification of documents on the same day of interview, relating to Age, proof of age relaxation Qualifications, Study certificate, Integrated Community certificate in case reserved candidates, certificate of exclusion from Creamy layer in case of B.Cs from Revenue authorities in terms of G.O. Ms. No.3, Backward Classes Welfare (C-2) Department, dt.04/04/2006, P.H. certificate in case of disabled candidates, etc., failing which, they will not be treated as eligible with reference to the particulars furnished by him/her in the Online application form / Certificates. The candidature of such candidate(s) shall be cancelled at any stage in the process of selection. TheCommission has the right to disqualify any candidate, if he/she is not found eligible for any reason. 3. In respect of posts of Deputy Superintendent of Police (Cat-2), Assistant Prohibition & Excise Superintendent in A.P. Prohibition & Excise Service, (P.C.No’s.04 & 05) the candidates have to undergo a Medical Examination for physical fitness before the competent Medical Board at Vishakhapatnam and also all the Disabled candidates have to undergo Medical Examination at respective Medical Boards. About APPSC Group 1 posts recruitment: APPSC published the Group I Services posts/Officers Recruitment 2017 notification and applications ware invited online from qualified candidates to the post of Deputy Collectors in A.P. Civil Service(Executive Branch), Commercial Tax Officers in A.P. Commercial Taxes Service, District Registrar in A.P. Registration and Stamps Service, Deputy Supdt. of Police (Civil) Cat-2 in A.P. Police Service, Assistant Prohibition & Excise Superintendent in A.P. Prohibition & Excise Service, District B.C. Welfare Officer in A.P B.C. Welfare Service, Municipal Commissioner Grade-II in A.P. Municipal Administration Service, Assistant Commissioner of Labour in A.P Labour Service in the State of Andhra Pradesh. The proforma Application was available on Commission’s Website (www.psc.ap.gov.in) from 31/12/2016 to 30/01/2017. The Screening Test for filling up of 78 posts of Group-I Services (Notification No. 36/2016) was held on 07-05-2017 FN from 10.30 AM to 01.00 PM at 174 venues in 13 Districts of Andhra Pradesh. A total of 93,482 candidates were appeared for the Screening Test. Click on "Click here" link given to this "Publication of Keys - Screening test held on 07/05/2017 for notification No: 36/2016 - Recruitment to Group - I Services (Published on 07/05/2017"
The Main examination(Conventional type)likely to be held from 17/08/2017 to 27/08/2017. Publication of Keys - Screening test held on 07/05/2017 for notification No: 36/2016 - Recruitment to Group - I Service. Objections would be accepted in written mode only in the format specified above till 15/05/2017. Late objections would not be accepted. The Commission is not responsible for the postal delay. 1. It is hereby notified that on the basis of the Screening Test (Objective Type) held on.07.05.2017 F.N (Sunday) at all 13 District centers of Andhra Pradesh for the posts falling under Group-I services (General Recruitment) vide Notification No.36/2016 dated.30.12.2016, the candidates whose Register Numbers are given below have admitted to the Main written (Conventional Type) examination i.e consisting of 06 compulsory papers in terms and conditions of the notification. The date of Main written (Conventional Type) examination will be held from 17/08/2017 to 27/08/2017 (10.00 AM to 01.00 PM), at Four Centres i.e. 01. VISAKHAPATNAM, 02. VIJAYAWADA, 03. TIRUPATI and 04. ANANTHAPURAMU only. A copy of this result can also be seen on the Commission’s Notice Board. The decision of Commission on objections, final key and candidate wise marks are also displayed on the web-site. 2. The candidates who are qualified for Main written (Conventional Type) Examination would be allowed to appear for the main examination in scheduled dates. The Commission has the right to disqualify any candidate, if he/she is found not eligible for any reason.